Country-breaded, juicy chicken tenders with Monterey Jack and cheddar cheeses, fresh tomatoes, sliced egg, colorful tortilla strips, and fresh mixed greens. Recommended with our Honey Mustard dressing. Grilled chicken, crisp apples, chopped walnuts, and crumbled bleu cheese all on a bed of fresh mixed greens. Pairs perfectly with our Lite Balsamic Vinaigrette. Get a little taste of home here at Friendly's! Enjoy a warm, nourishing crock of Chicken Noodle Soup. Get a little taste of home here at Friendly's! Enjoy a warm, nourishing crock of New England Clam Chowder. Just need a little green? 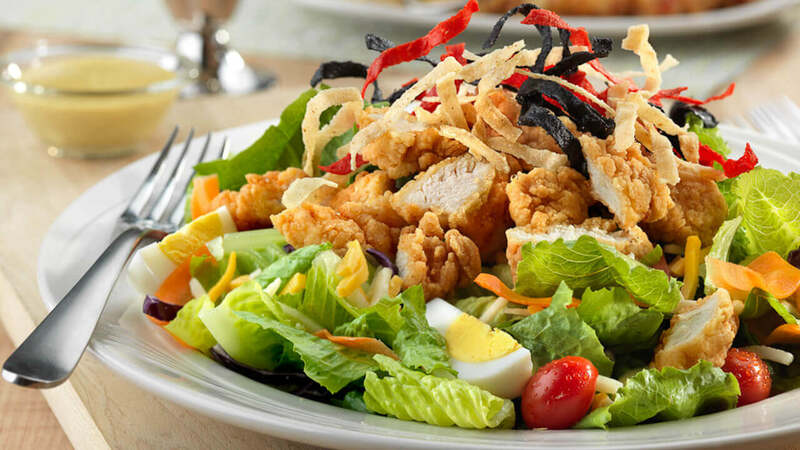 Grab a Side Salad with any Friendly's meal. Ah, soup and salad! They're the dynamic duo of any meal! Go ahead and team up to enjoy a crock of warming soup or chowder with a fresh side of mixed green salad. Fajita seasoned chicken breast, grilled corn, chopped tomatoes, diced red onions and Monterey Jack & Cheddar cheeses, garnished with sour cream and guacamole on fresh mixed greens. Recommended with our Guacamole Ranch Dressing. Get a little taste of home here at Friendly's! Enjoy a warm, nourishing crock of Tomato Basil Soup.